In honor of Rotary International’s 25th anniversary celebration of women being accepted into Rotary membership, the Frostburg Rotary held a Salute to Women Reception recently at St John Episcopal Church in Frostburg. 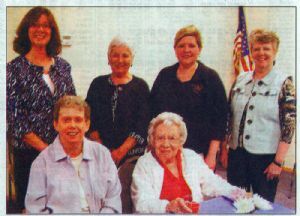 Frostburg Rotarians Vicky Peterson and Linda Brumage presented Service Above Self Awards to, seated, Sharon Robinson, left, and Jane Grindel, and standing, from left, Maureen Brewer, Peggy Kealy, Michaela Linn and Barb Armstrong. Not pictured are Barbara Ornstein and Diane Romaine. The names of those receiving the awards were chosen from nominations received from community members who identified women who have made significant contributions in education, health care, business, and community service. In addition to the awards, a DVD was shown entitled “Women in Rotary” and the Mountain Ridge High School Chorus, directed by Linn, provided a musical tribute. Frostburg Rotary Club President Bill Davis and Rotary District Governor Melinda Golden gave special remarks honoring the contributions of the women. Mayor Robert Flannigan presented a proclamation from the city of Frostburg. Allegany County (Md.) --Biography; Allegany County (Md.) --Women.